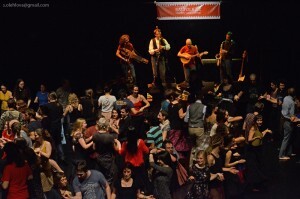 The Ballsaal Palindrone at Sargfabrik was a Palotian homematch: Full house, incited dancers and great guest musicians from France – Duo Parasol. An event worthy of a city which prides itself as the world’s capital of carnival ballrooms (just think of the Wiener Opernball). Next morning we were on our way to Prague. For the first time in Palotian history – which is actually quite amazing as the band has toured so many countries in and out of Europe, and had never made it to this neighboring country (it is just 400 kilometers from Vienna to Prague). Our Czech premiere took place at the Divadlo Ponec which is considered one of the most important theaters for contemporary and experimental dance. Apart from countless local and international events presenting motion art the Ponec regularly organizes “interactive dance nights”, such as the Prague Balfolk Weekend. This year on stage: Bal Lab (CZ), ba.fnu (CZ), Zlabaya (FR), Parasol (FR), Stefano Baldan (IT), Herrmann Fritz (AUT) and Hotel Palindrone. Dance aficionados from all over Central Europe showed up in Prague. Among them a friend who has enchanted Palotian ballrooms with his charm and elegance – just as a dancer or sometimes as a dancing master: Christian Reich, to whom we hereby award the Prix d’Honneur Palotique. It was our intention to celebrate this international prize at the Prague Balfolk, but due to the crowded ballroom and to quick stage management we had to postpone the ceremony to our next Ballsaal in Vienna. Regular readers of Palotica might know that we do not focus so much on concert reports or insider news displaying the glamourous world of folk. There would not be much to write about because musicians in our scene are pretty normal people. No stuff for the yellow press. Just “Carlos Nuñes chills out with a glass of Albariño“, “Andy Irvine prefers German sausages to English bangers“, “Gabriel Yakoub’s Citroen 2CV broke down” or “Hotel Palindrone troubled by bagpipe-phobia?”. Sorry for being that boring. So we thought about offering you something else. Touring all over Europe and sometimes Overseas we experience a lot and we think some of our impressions are worth sharing, as we very often travel to outstanding places which are (fortunately) ignored by mass tourism. This is not the case with Prague. So, what should we write about the “Golden City”? Should we complain that its beauty is its curse? About the crowds rolling through the streets? Telling our readers that travelling connoisseurs are right to sniff at mass tourists invading Prague or Venice? Before slagging the wrong-doers and boasting with our refined art of travelling we should consider that many of those tourists (very often Chinese and Japanese) realize a life-long dream: Rome, Venice, Vienna, Rothenburg, Heidelberg, Paris. In two weeks, as the usual Asian holiday entitlement does not concede more time. Possibly they will never ever afford another transcontinental voyage. But when they return home, such a European tour means a great deal of social prestige, which explains the “Japanese photomania” (which also makes me laugh or feel annoyed – you see, how quickly we can be snobs) because they have to prove their journey was worth the effort. Of course this kind of travelling causes lots of damage, ecologically and culturally – I don’t have to go into details about that (living next to Vienna I could tell you stories). But should we close attractive cities and landscapes for mass tourists? Who will be allowed to visit Florence, Crete or Normandy? Should we insist on traveller-licenses (after attending twenty hours of a Cultural Science Seminar) or entry fees? What about European holiday-makers? Are they supposed to stay in Frosinone, Blény-sur-Plume, Unterbüxlbaxlboxlhausen or Krostinovac? By the way – Austria contributed a lot to Asian Europeamania. The Vienna Philharmonic Orchestra and the Vienna Choir Boys serve as efficient testimonials throughout Far East which is also an attractive market for Mozartkugeln (round chocolate pralines whose name cannot be translated into English or Italian without offering the chance to crack a dirty joke). Not to forget the Herminator’s (for non-Austrians our skiing star Hermann Maier) crash and his following victory some days later at the Olympic Games in Japan. Due to the Herminator and to Terminator Arnold Schwarzenegger many Asians think Austrian men are rather tough and sturdy. Obviously they have never seen a Hotel-Palindrone-photo. We should not forget the film Sound of Music which over decades has influenced the Americans’ image of Austria. Unfortunately it still works and is going to have some impact on Austro-American foreign policy. Donald Trump appointed Patrick Park as the new ambassador in Vienna. According to an interview in the Palm Beach Daily News Mr Park thinks he is well-prepared for the job: “I have seen Sound of Music seventy-five times. I know every word and song by heart.” I guess it would be rather difficult to find more than thousand Austrians who have ever seen the film, and there will be none who could quote even one word. But now we know what job in the US we can offer Austrians who have seen the same Chuck-Norris-film at least twenty-five times. Back to Prague, a piece of advice for all who need to take a rest. Next to the usually over-crowded Karluv Most (Charles’Bridge) look for Misenska Road. There you will find a little tavern called Vinograf that is popular with native people and foreigners. As an alternative to the omnipresent beer this fine snug offers great Czech wines. Above all Veltliner, Riesling and Blaufränkisch from Mikulov on the Moravian-Austrian border. There you could reflect on the future of travelling. Or on Donald Trump’s choice for the US-Embassy in Prague and what the qualification of that guy looks like. Gulping down seventy-five gallons of Czech beer?